Click here for a Heelys size chart. Zoom through the room with the Force wheeled shoe! Mid-top silhouette with a wide skate body. Synthetic leather and mesh uppers. Full lace-up closure. Padded collar for added comfort and support. 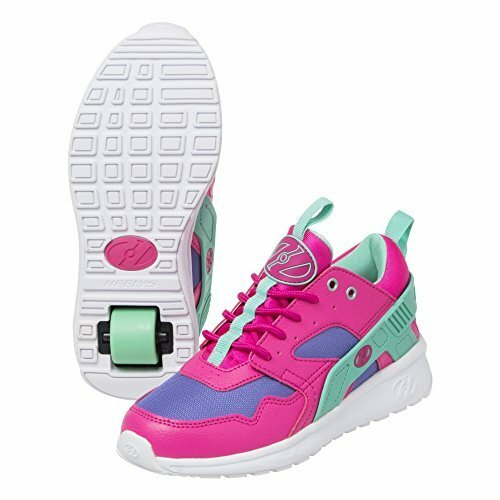 Heelys Wave Comfort Heel Bracket provides comfort and stability. Removable foam sock with EVA heel pad for added cushioning. Faux vulcanized cupsole with rubber outsole. Abrasion-resistant brake pad. ABEC 5 Bearings/1 low profile wheel. Imported. Measurements: Weight: 12 oz Product measurements were taken using size 2 Little Kid, width M. Please note that measurements may vary by size. Zoom through the room with the Force wheeled shoe! Full lace-up closure. Padded collar for added comfort and support. Heelys Wave Comfort Heel Bracket provides comfort and stability. Removable foam sock with EVA heel pad for added cushioning. Faux vulcanized cupsole with rubber outsole. Abrasion-resistant brake pad. ABEC 5 Bearings/1 low profile wheel. Imported. Measurements: Weight: 12 oz Product measurements were taken using size 2 Little Kid, width M. Please note that measurements may vary by size.